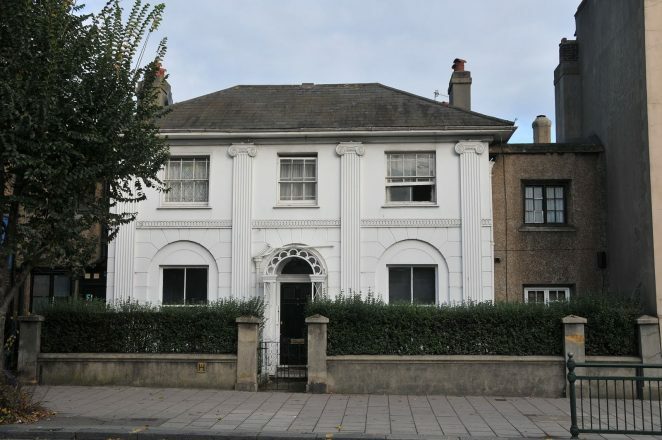 This is now a terraced house, though it was designed as detached; it is the only remaining residential house in London Road. It was built c1822-30 with later additions. The building, which became St Bartholomew’s Vicarage in 1882, was probably designed by Amon Wilds and Charles Augustine Busby. The central part of the house is of three window range, double-fronted, under a hipped roof. There are two wings, slightly set back to either side. These are finished in render and are presumably additions of a later date. On the principal part, the ground floor is decorated with banded rustication with four fluted Ionic pilasters flanking the three central openings and a stucco band of guilloche ornamentation. It has a round-arched entrance with fanlight and an ironwork porch. The entrance and the flat-arched ground-floor windows are set back under round arches. I believe that this may have originally been built as ‘Arundel Place’ for Nathaniel Cooke, Junior, who was the organist at the Chapel Royal, a composer of some repute and who also taught music here. Thereafter, the premises continued to be used as a school, but the name had been changed to ‘Cambridge Lodge’ by the 1840’s. At one stage, John Ackerson Erredge, the well known local historian and author, taught here. Around 1866 the name was again changed to ‘Cambridge Cottage’, but by the 1890’s it was once again called ‘Cambridge Lodge’. For many years this was the Clergy House for St Bartholomew’s Church. It was sold off in the 1970s. The last resident was Rev. Richard Helby Chambers. I remember going to play at the house with James Hester in the mid to late 70s when his father, Canon John Hester, was vicar of St Peter’s. We both went to St Bartholomew’s.